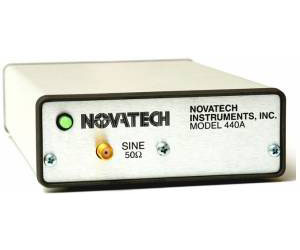 The Model 440A Programmable Signal Source generates a low distortion sinewave signal from 200 kHz to 400 MHz with 1 Hz resolution. The 440A contains an internal temperature compensated crystal oscillator that can be locked to an external reference in 8kHz steps, allowing the 440A to lock to common telecom signals, such as T1 and E1 rates, as well as common instrumentation frequencies such as 5 MHz and 10 MHz without external hardware. When locked, the accuracy and stability of the 440A will match that of the reference. The relative phase of the 440A can be controlled with 14-bits of resolution. The 440A is set by sending simple text commands over a 19.2 kBaud serial interface. Four 440A can be mounted in a 1U rack and eight in a 2U rack with optional rack adapters. The 440A operates from a single +5VDC power supply (AC-line adapter provided).